Here’s a light and healthy dinner that only requires one pot! The broth has a nice flavor from the shallots and lemon. 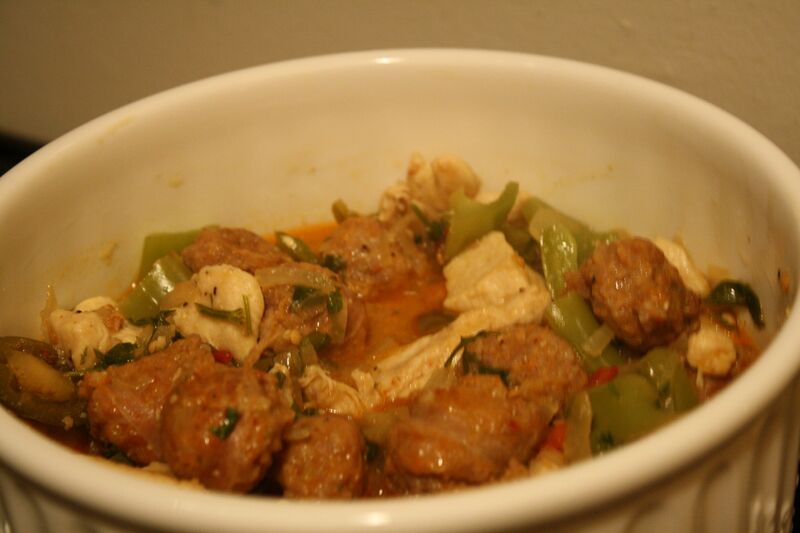 The meatballs — which are gluten-free — are quite tasty thanks to the garlic, shallots, scallions, and red pepper flakes. The braised kale is tender. Overall an easy, healthy weeknight meal. Add 1/3 of ground chicken and cook just until cooked through, breaking up any clumps. Transfer to a medium bowl and let cool slightly. Add remaining chicken meat, salt, and several grindings of black pepper. Mix just to combine. Wipe out pot and add remaining Tbsp. oil. Heat over medium-high heat until hot but not smoking. Form meat mixture into 8 meatballs each about 2–2 1⁄2-inch in diameter and add to pot (mixture will be soft). Cook until light golden brown on all sides, 6–8 minutes total. Remove meatballs to a plate; set aside. Bring to simmer, lower heat and cover. Cook meatballs until cooked through, 8-10 minutes. Add kale to pot, and cook until tender and bright green, 4–5 minutes. Season with salt and pepper and remove from heat. 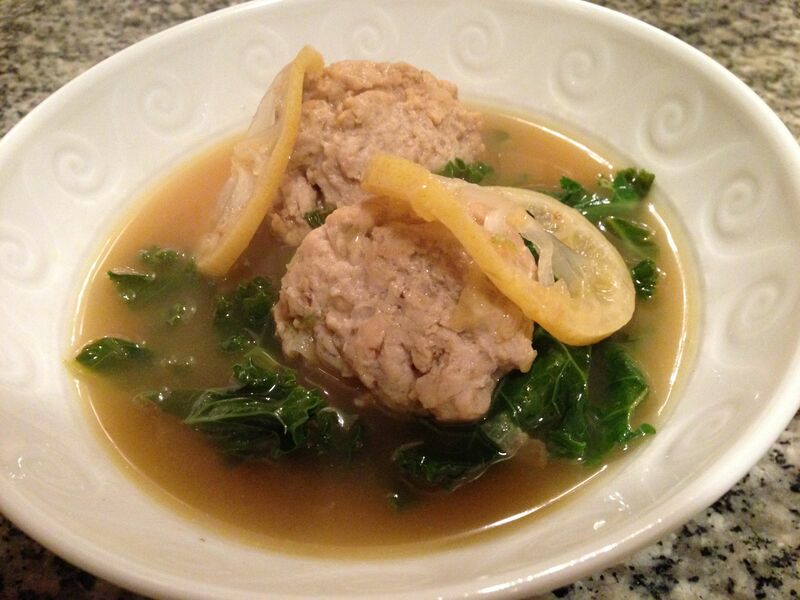 Divide kale and sauce among 4 shallow bowls, topping with meatballs and lemon slices. Garnish with sliced scallion tops and serve. 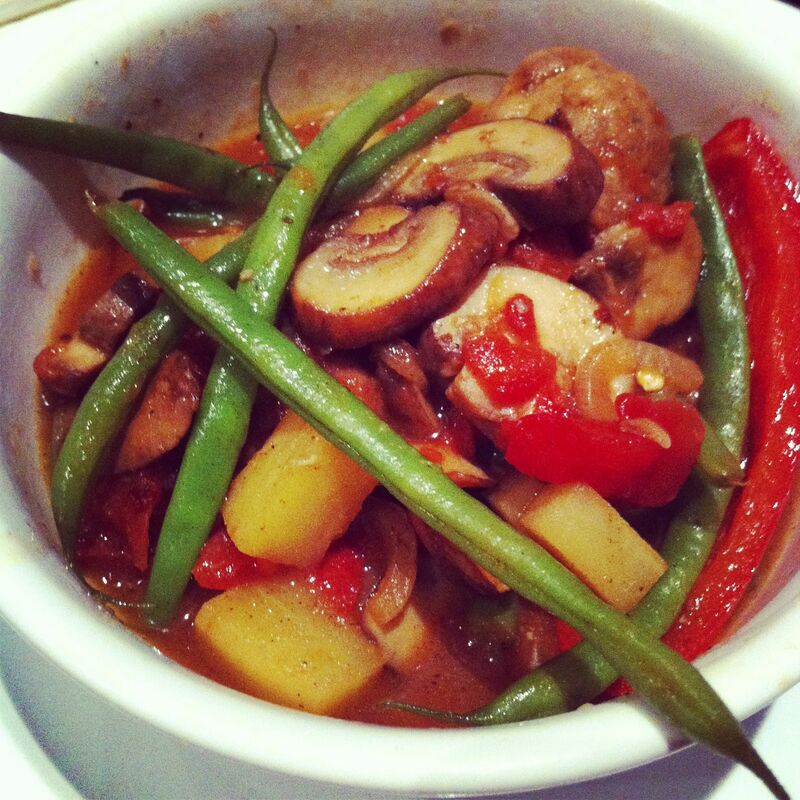 Here’s a delicious dish for the cooler weather! The stew wasn’t what I expected — it was much earthier and less tomato-y. But we loved it! Giada rarely steers me wrong. The mushrooms (I used baby bellas) added a really nice flavor. And, the meatballs were a delicious combo of ground beef and sweet Italian sausage. I served it with some crusty bread. For the meatballs: Place the bread and 3 tablespoons water into a medium bowl. Mash to a paste with a spatula. Add the beef, sausage, egg, parsley, salt and pepper. Blend the mixture thoroughly with your hands or a flexible spatula. Form the mixture into 10 to 16 meatballs. Arrange the meatballs on a parchment paper-lined baking sheet until ready to use. For the hearty meatball stew: Sprinkle the meatballs with the flour and turn to coat with any flour still on the foil. Heat a large heavy nonstick skillet over medium heat for 1 minute. Add 2 tablespoons of the olive oil. Drop the meatballs into the skillet, spaced apart. Cook until the bottoms are set and brown, about 2 minutes. Using a flexible thin spatula, turn each meatball onto an uncooked side and cook until the bottoms are set and brown, about 2 minutes longer. Turn and cook a third side, until set and brown, about another 2 minutes, so the meatballs are browned and set all over. Transfer the meatballs to a large plate. Heat the remaining 2 tablespoons oil in the same skillet over medium-high heat. Add the onions, peppers, 1/4 teaspoon of the salt and 1/4 teaspoon of the pepper. Cook until soft, 4 minutes. Add the mushrooms and the remaining salt and pepper. Cook, stirring occasionally, until the mushrooms have softened, about 5 minutes. Add the potatoes, beans, tomatoes, red pepper flakes and broth. Bring the mixture to a boil. Reduce the heat to a simmer, cover the pan and cook until the potatoes are tender and the meatballs are cooked through, about 20 minutes. Here is a delicious slow cooker recipe! There is nothing better than coming home after a long day to a fully prepared dinner. 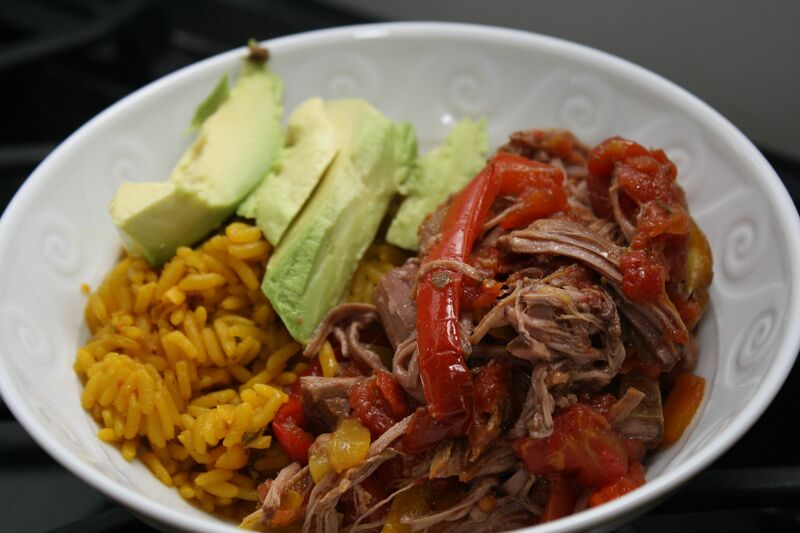 Cuban-braised beef, more commonly called Ropa Vieja, is shredded flank steak in a tomato-based sauce base. The steak slow cooks in the sauce with the oregano and cumin giving it a great flavor. The normally tough flank steak shreds easily after 7 hours in the slow cooker. While some slow cooker recipes require you to sear the meat or cook some ingredients before adding to the pot, this recipe is so quick. The only real prep is slicing the red peppers! I served the ropa vieja with yellow rice and avocado. It was a delicious meal. The only disappointment was that it did not keep well. The leftovers just were not as tasty. In a 5- to 6-quart slow cooker, combine the tomatoes, bell peppers, onion, oregano, cumin, 1½ teaspoons salt, and ¼ teaspoon pepper. Nestle the steak among the vegetables. Cook, covered, until the meat is tender and pulls apart easily, on high for 4 to 5 hours or on low for 7 to 8 hours. 25 minutes before serving, cook the rice according to the package directions. Using two forks, shred the beef and mix it into the cooking liquid. Serve with the rice and top with the avocado and cilantro. 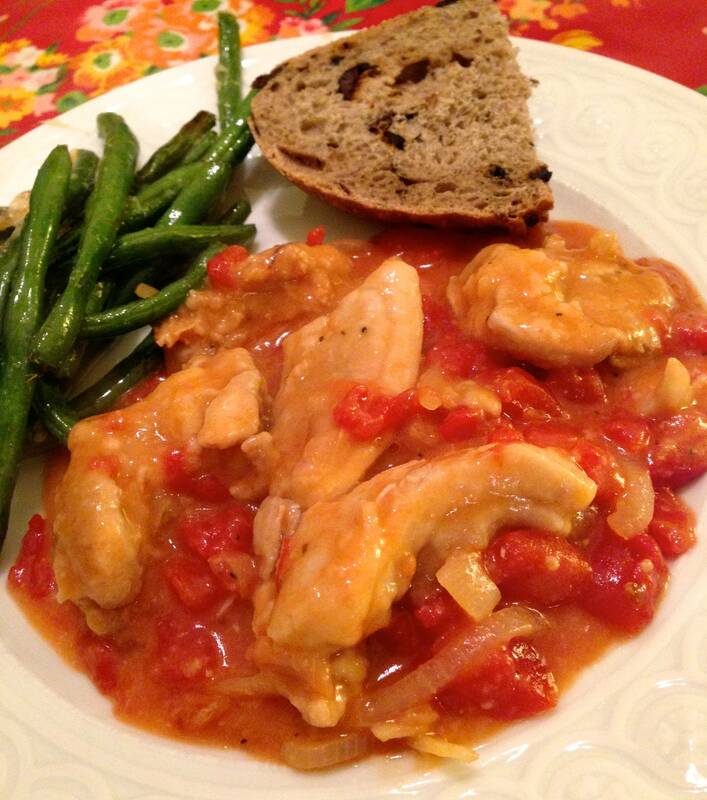 Here is a super quick and delicious fall meal! This white bean and sausage stew requires few ingredients and only one pot so it is perfect for weeknight cooking. To lighten the dish up, try turkey sausage instead of pork sausage. Also, the recipe calls for escarole but you can use your favorite green or whatever you have in the fridge — I made the recipe with kale. Spinach would be tasty as well (though it wouldn’t need to cook quite as long as kale or escarole). If you want to spice up the dish more, add some red pepper flakes for an extra kick! Be sure to serve with crusty bread and plenty of Parmigiano-Reggiano! Heat the oil in a heavy 5- to 6-qt. Dutch oven over medium heat. Add the onion and cook, stirring occasionally, until tender, 5 to 6 minutes. Add the sausage, raise the heat to medium high, and cook, stirring and breaking up the sausage with a wooden spoon or spatula until lightly browned and broken into small (1-inch) pieces, 5 to 6 minutes. Add the garlic and cook for 1 minute, then stir in the beans. Add the escarole to the pot in batches; using tongs, toss with the sausage mixture to wilt the escarole and make room for more. When all the escarole is in, add the chicken broth, cover the pot, and cook until the beans are heated through and the escarole is tender, about 8 minutes. Season to taste with the vinegar and salt. 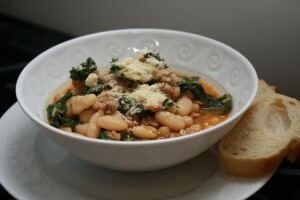 Transfer to bowls and sprinkle each portion with some of the Parmigiano. I love chili! It is such a satisfying fall and winter meal. Plus, it usually packs some heat which I love. And, it usually only requires a single pot! I was looking for a new chili recipe using ground beef so I could use the remaining ground beef from our half steer. This Fine Cooking recipe was quick enough for a weeknight meal and had a unique method of pureeing black beans, diced tomatoes, and chipotles in adobo sauce to thicken the chili and provide a wonderful hot smoky flavor. The red onion, avocado and lime relish that is served on top of the chili is a great addition to the dish (or to any chili or taco recipe). I used two avocados rather than the one called for in the recipe since Tim and I both love avocado. I will definitely be making this chili recipe again this fall! Put one-third of the beans into the bowl of a food processor, along with the tomatoes and their juices, chipotle, and adobo sauce. Process until smooth and set aside. Heat the oil in a 5- to 6-quart Dutch oven or similar heavy-duty pot over medium-high heat until it’s shimmering hot, about 2 min. Add the beef, season with 1/2 tsp. salt, and cook, using a wooden spoon to break up the meat, until it loses its raw color, about 3 minutes. Transfer the beef to a large plate using a slotted spoon. Add half of the onion and 1/4 tsp. salt, and cook, stirring, until it begins to brown and soften, about 3 min. Reduce the heat to medium. Add the chili powder and cumin and cook for 20 seconds. Add the remaining black beans, the puréed bean mixture, and the beef to the pot and simmer for 10 min., stirring frequently. Add half of the lime juice, half of the cilantro, and salt and pepper to taste. If the chili is thicker than you like, it may be thinned with water. Meanwhile, in a small bowl, mix the remaining lime juice and onion with the avocado. Season generously with salt and pepper. 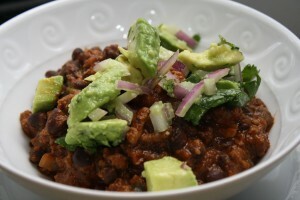 Serve the chili topped with the avocado mixture and remaining cilantro. Here is a delicious way to use end of summer produce: ratatouille! 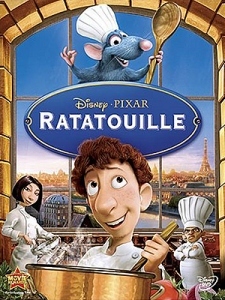 In addition to being a super cute Pixar movie, ratatouille is a stewed vegetable dish with eggplant, zucchini, red pepper, tomatoes, garlic, and onions. 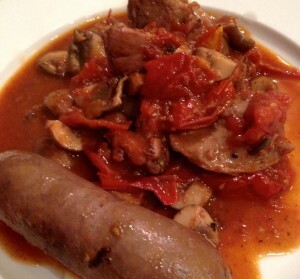 When I was a vegetarian, my mom would make me a delicious ratatouille. I didn’t have her recipe but saw this one in Real Simple and it looked quick enough for a weeknight dinner. I followed the recipe with a couple of minor changes. I used a red onion for a little extra flavor. And unfortunately I was out of fresh basil so I used a 1/2 teaspoon of herbs de Provence. I served the ratatouille with quinoa for a healthy meatless meal! Tim and I both enjoyed the dinner and I don’t even think Tim missed the meat. Over medium-low heat, add the oil to a large skillet with the onion, garlic, and bay leaf, stirring occasionally, until the onion has softened. Add the eggplant and cook, stirring occasionally, for 8 minutes or until the eggplant has softened. Stir in the zucchini, red bell pepper, tomatoes, and salt, and cook over medium heat, stirring occasionally, for 5 to 7 minutes or until the vegetables are tender. Stir in the basil and few grinds of pepper to taste. Here is a super quick and healthy summer meal! 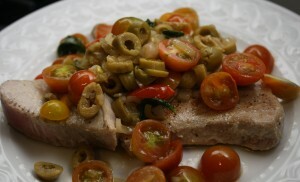 The dish has lots of flavor from the tomatoes, olives, and lemon juice. What a fresh and summery combination. I used sushi-grade tuna from my favorite fish store — The Lobster Place — and served it rare to medium-rare. Delicious! And, you can’t beat the cleanup of a one-pot dish. Season the tuna with 1 tsp. salt and 1/4 tsp. pepper. Heat the oil in a 12-inch skillet over medium-high heat. Arrange the tuna in the skillet in a single layer and cook, turning once, until done to your liking (3 to 4 minutes for medium rare). Transfer the tuna to a large plate. Reduce the heat to medium and add the shallot to the skillet. Cook, stirring, until golden-brown, about 1 minute. Add the tomatoes, olives, basil, 1/2 tsp. salt, and a few grinds of pepper; cook until warmed through and the tomatoes are just softened, about 2 minutes more. Remove the skillet from the heat and gently stir in the lemon juice. Transfer the tuna to plates, top with the tomato salad, and serve.